In case you missed it, my recommendations for what to see, do, buy, & eat when in “Japan’s most photogenic city” are now up on the CNN Travel site. Everyone should visit Kyoto at least once. It’s Japan’s best preserved ancient city. Shrines, temples, palaces, gardens … the city is home to thousands of architectural wonders, including 17 UNESCO World Heritage Sites. Geisha and locals wearing traditional kimonos aren’t unusual sights. But Kyoto is a modern city with a dynamic music and arts scene, lively markets and restaurants serving the best Japanese cuisine. 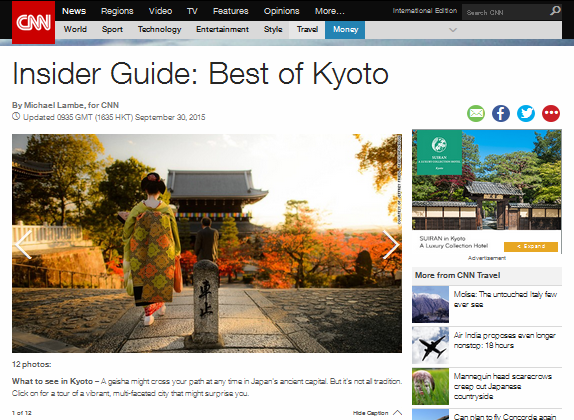 There’s too much to see on a single visit — so we have whittled down the best of Kyoto. Thanks also are due to Chris Rowthorn who put CNN in touch with me in the first place.